The bright yellow colors of the sunset glisten off a pond that adorns the landscape between Red bay and Mary's Harbour in Southern Labrador. 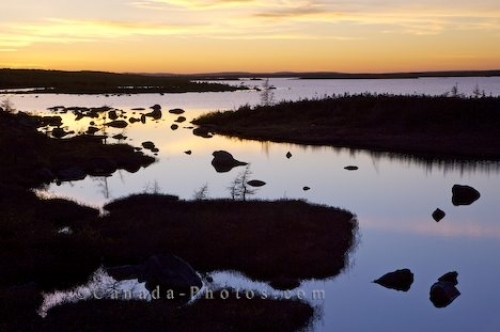 The yellow hues from the sunset reflect across the surface of the calm waters of a pond which makes up part of the picturesque landscape of Southern Labrador. The entire sky is filled with yellow as thin wisps of clouds float aimlessly about which will eventually darken as the night hours begins to take over. Sunset over a pond along Highway 510, the Labrador Coastal Drive between Red Bay and Mary's Harbour, Viking Trail, Trails to the Vikings, Southern Labrador, Labrador, Canada. Picture of the sunset over a pond between the towns of Red Bay and Mary's Harbour in Southern Labrador, Canada.